Last week, Göran R Buckhorn attended a presentation of the proposed master plan for the Mystic River Boathouse Park and the Hart Perry Boathouse in Mystic. In September last year, Rob Simmons, first selectman of Stonington (Connecticut), and his wife Heidi Paffard Simmons hosted an event to kick off a campaign to raise funds for a Hart Perry Boathouse – named after the great advocate of rowing – located on the Mystic River at something called the Mystic River Boathouse Park in Mystic (which HTBS covered here). On Thursday, 11 October, the public was invited to Latitude 41° Restaurant for the unveiling of the proposed master plan. The restaurant is next door to where the boathouse and park are going to be located on the property at 123 Greenmanville Avenue. Approximately 70 people had gathered to hear about the plan from the Mystic River Boathouse Park Implementation Committee. Present were also Chad Frost of Kent + Frost Landscape Architecture, a Mystic-based company that is designing the $2.2 million 1.5-acre park, and Alex Anmahian of Anmahian Winton, the Cambridge-area architectural firm, which is selected designing the $2.5 million boathouse. 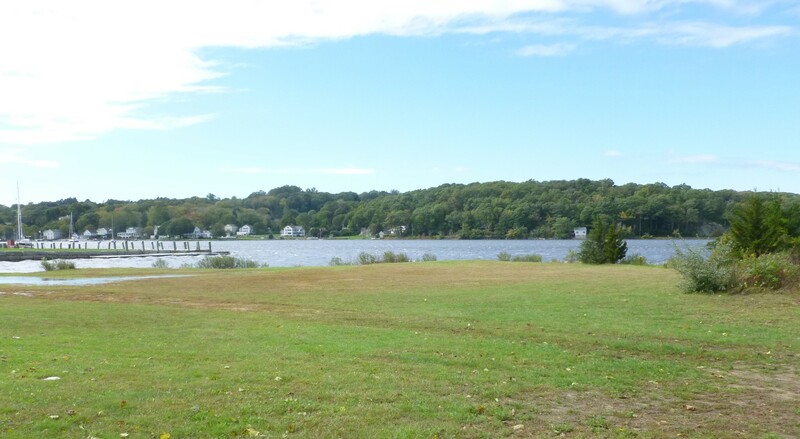 The location for the Mystic River Boathouse Park and Hart Perry Boathouse. Photo: Göran R Buckhorn. Rob Simmons, who chairs the Mystic River Boathouse Implementation Committee, started the meeting by telling a story how he, for many years driving down Greenmanville Avenue, or Route 27, into Mystic, was wondering what could be done to the property that had been vacant for several years. 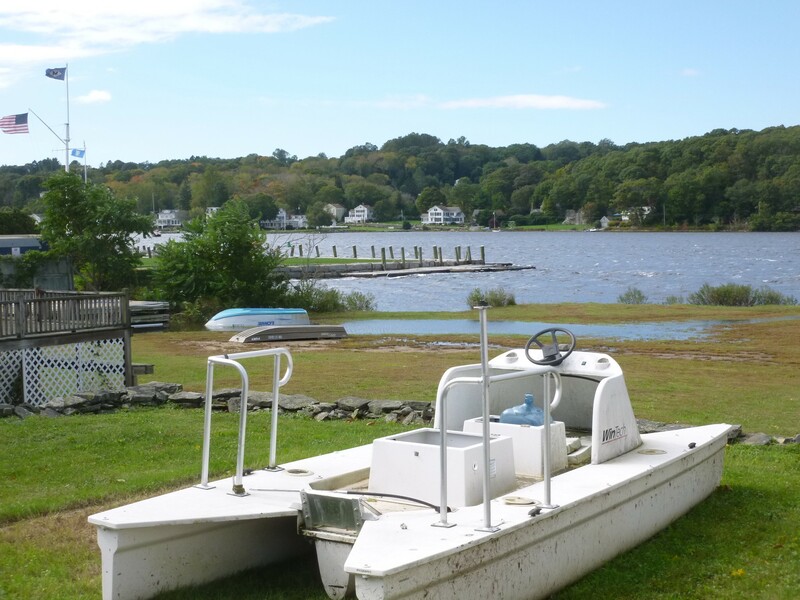 Then Simmons was approached by Mike O’Neill, director of the Stonington High School rowing and their support group Friends of Stonington Crew, who was interested in the property by the river for the crews of Stonington. The young men and women rowing had outgrown the docks and spaces they borrowed from Mystic Seaport Museum, which is located just south of 41° Latitude Restaurant. 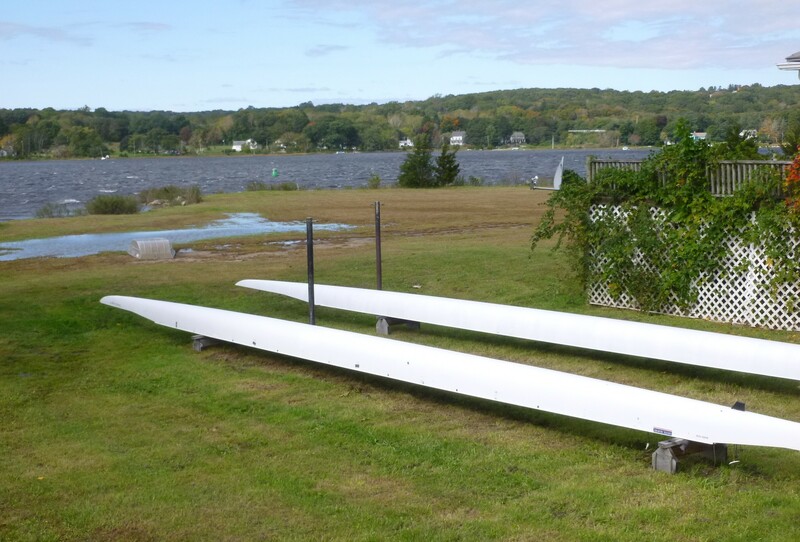 Slightly more than a year ago, at a Stonington town meeting, it became clear that the townspeople stood behind the decision to secure the property for a park for the community and building a boathouse for the high school rowing team. 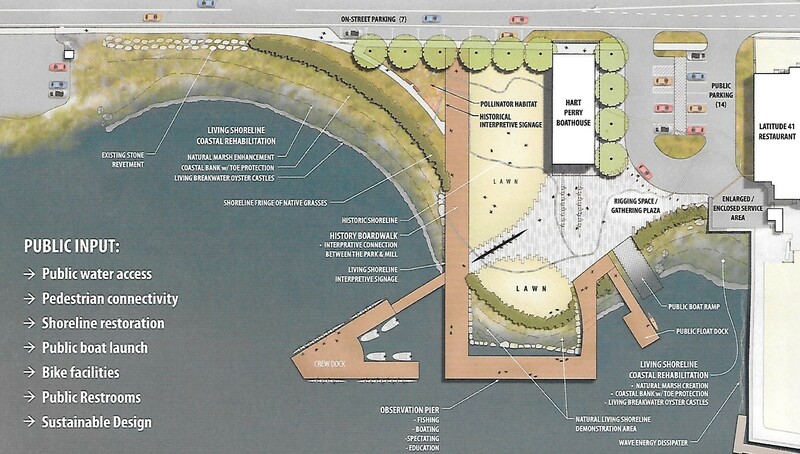 ‘But it’s a community park, and the boathouse can be used by recreational rowers as well,’ Simmons underlined strongly. While it will be town money used to secure the property for a park, the boathouse will be privately funded, Simmons said. Some of the boats of Stonington High School Crew. Photo: Göran R Buckhorn. ‘Tonight, we are going to show you the concept, the plan, for the boathouse to get your [the public’s] feedback,’ Simmons remarked. He continued to say that the implementation committee had worked closely with the Trust for Public Land, which is a nonprofit organisation with a mission to ‘create parks and protect land for people, ensuring healthy, livable communities for generations to come,’ as the organisation says in a statement. A blustery day on the Mystic River at property 123 Greenmanville Ave. Photo: Göran R Buckhorn. Then it was Chad Frost’s turn. He said: ‘Earlier, we walked around the property with community members, who told us their priorities for a community park.’ In the master plan, Frost and his company have considered what the public wants and what the budget allows the company to do. Frost has tested the soil on the property. It’s contaminated, but not too badly. In the distance is the Stonington High School Crew’s former ‘home’, Mystic Seaport Museum. Photo: Göran R Buckhorn. 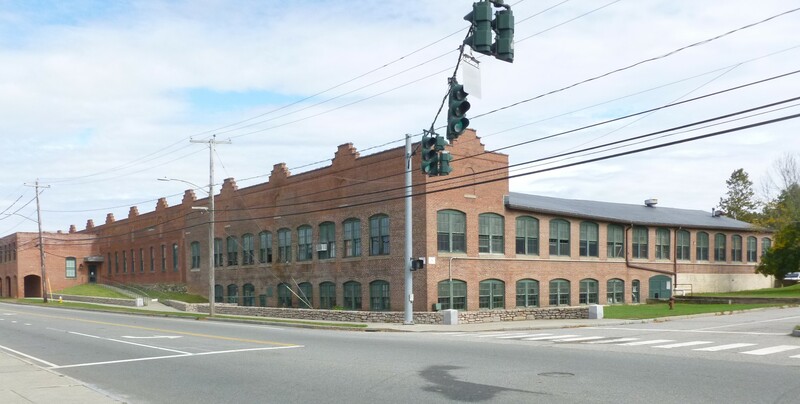 Frost mentioned that this shoreline property would not exist had it not been for the Rossie Velvet Mill across the street from the property. 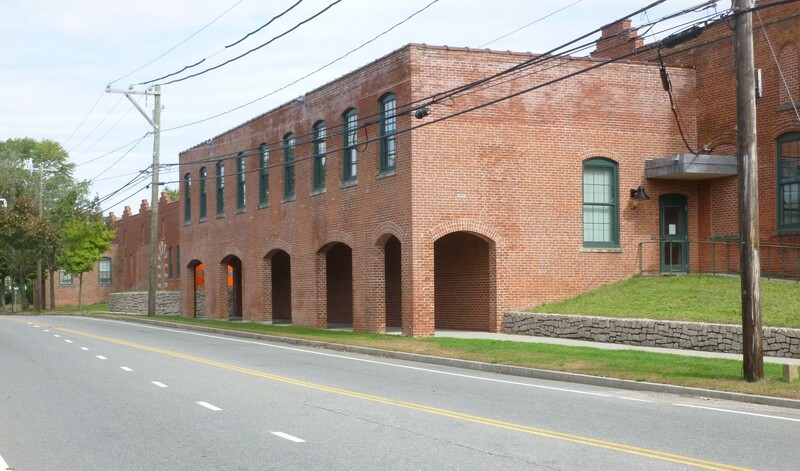 The Rossie Mill, which now belongs to Mystic Seaport Museum which uses it as a collections and research centre, was built in 1898 and thereafter got several extensions when the silk industry grew. The shoreline property was created from coal slag that had been disposed there from the mill. The tunnel where the filling had been transported is still under the street. 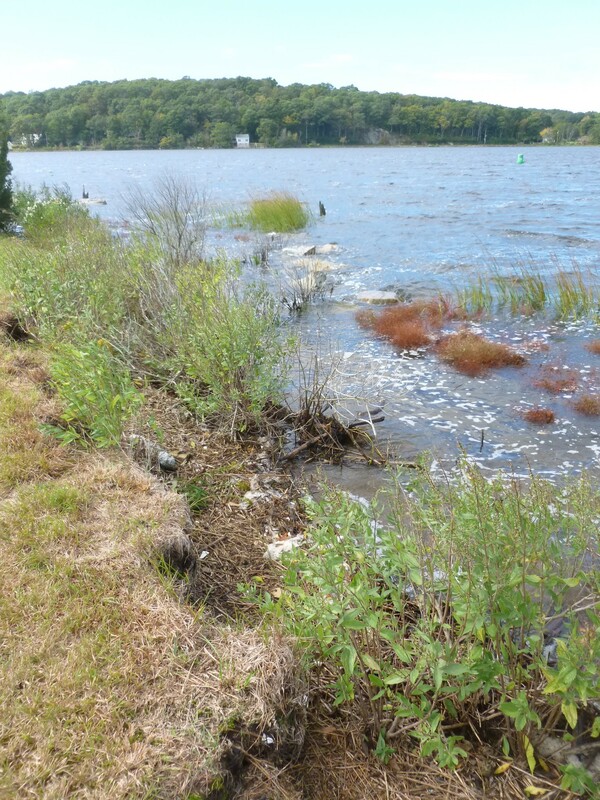 Here will be a ‘living shoreline’. Photo: Göran R Buckhorn. After the contamination has been removed, Kent + Frost will create a ‘living shoreline’ where nature will reclaim the land using concrete blocks containing oyster seeds to create so-called oyster castles as well as coastal plants and marshland. 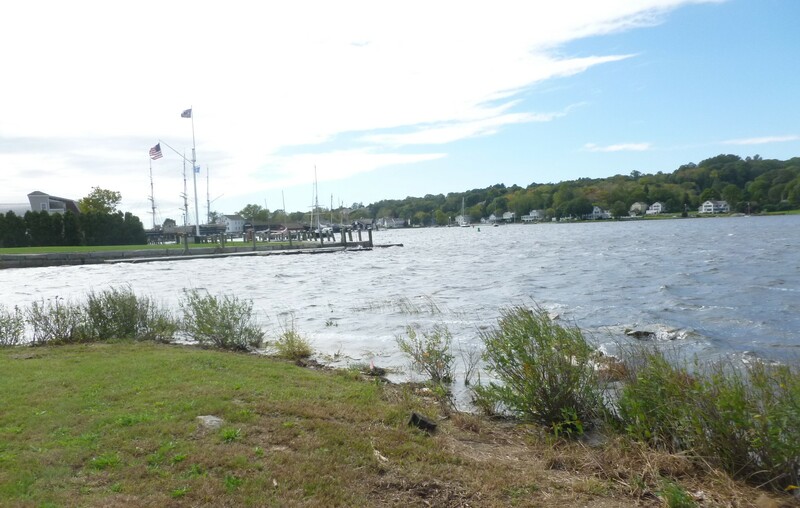 Plans call for floating docks both for the Stonington High School crews and for the public, as well as a ramp to put in boats, kayaks, canoes and paddleboards. A long boardwalk will give public access down to the shore to watch the water activities. The property viewed from the shoreline. The red brick building is the Rossie Velvet Mill. The grey shed on the left and the old house on the right will be torn down to give room for the Hart Perry Boathouse. Photo: Göran R Buckhorn. After Frost’s presentation, questions came from the floor about public restrooms, maintenance of the park and what is going to happen with the floating docks when the river freezes over? ‘I love this plan, it’s fantastic,’ Tom Sanford, local master rower and a member of the boathouse capital campaign steering committee, said. And the people in the room seemed to agree with him. Though, there were concerns raised about the parking. Greenmanville Avenue is a busy road especially during the summer months. Mystic resident Matt Ferrier thought that parallel parking on the road, which is in the plan, would become a nightmare. Frost, on the other hand, answered that he believed that parking on the street would have a ‘calming effect on the traffic’. The plan calls for 14 parking spots in the south end of the site and seven along Greenmanville Avenue, which would not be enough during those times there are regattas on the river when buses and boat trailers will come to the site to drop off rowers, their boats and equipment. When it came to the Hart Perry Boathouse, architect Alex Anmahian gave a philosophical presentation of how his firm had approached the ideas of the boathouse. Anmahian’s firm, which won the bid (26 architectural companies had put in bids to design the boathouse), has experience building boathouses. The firm built the award-winning $11.45 million Harry Parker Boathouse for Community Rowing, Inc., in Boston in 2008. The Rossie Mill now belongs to Mystic Seaport Museum. Inside is the Collections and Research Center. In the rear end of the building is the Museum’s Watercraft Hall. Photo: Göran R Buckhorn. Anmahian has worked closely with Frost on the design. 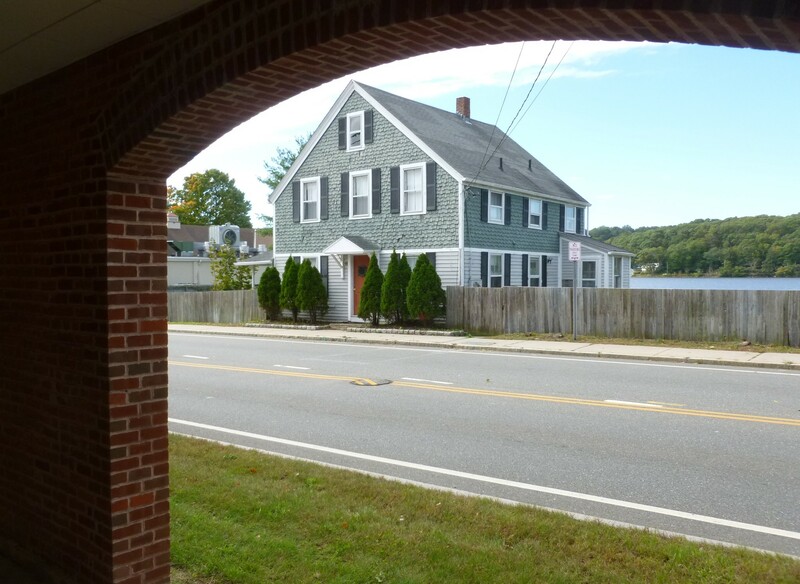 Looking at the surrounding area, Anmahian particularly studied the different buildings at Mystic Seaport Museum and the Rossie Mill across the street. Early on, ‘looking for context,’ as Anmahian put it, it was decided that the arcade at the Rossie Mill, ‘which projects itself out to the street,’ and the boathouse ‘with an overhang’ should form a ‘gateway’ into Mystic. The arcade at the Rossie Mill, ‘which projects itself out to the street.’ Photo: Göran R Buckhorn. Property 123 Greenmanville Ave. seen from the Rossie Mill side of the street. Photo: Göran R Buckhorn. Anmahian and his team started to look how a boat works in the water. 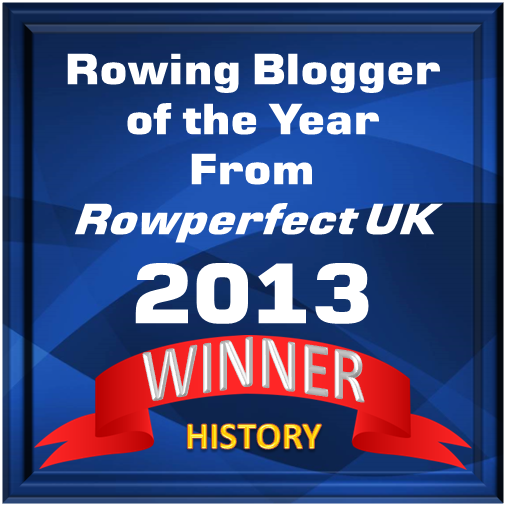 With the help of a computer programme that modelled the movement of the oar in the water, ‘we found these beautiful patterns. We tried to capture some of these patterns and transform those into surfaces and to express that onto the building,’ Anmahian said. Hart Perry Boathouse and the Mystic River Boathouse Park – how an artist sees the master plan. Courtesy of the Mystic River Boathouse Park Implementation Committee. An artist’s view of the Mystic River Boathouse Park from the Mystic River. Courtesy of the Mystic River Boathouse Park Implementation Committee. The first floor will hold the boats, oars and the public restrooms. There will be a staircase and an elevator going up to the second floor, which will have ergs, weights, lockers and offices for the coaches. At the end of the presentation of the boathouse, there were some questions from the audience about the building’s lighting at night (‘not too bright to disrupt the community?’), how much energy will the building use?, will there be any accessibility for the public when there are rowing regattas on the river?, etc. 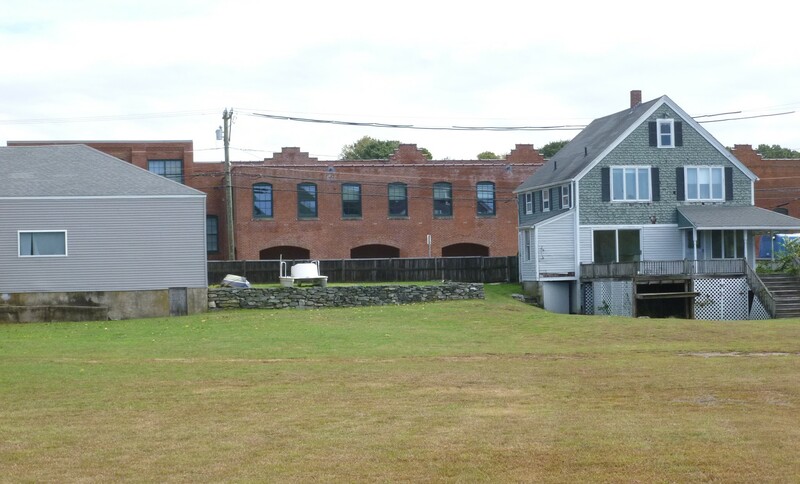 Of course, before any work can begin for the park and the boathouse, the town of Stonington will have to receive approval from the Planning and Zoning Commission and other state agencies. If everything goes according to plans, it’s reasonable to have ‘shovels in the ground next fall,’ Mike O’Neill said. This is following the same schedule as Rob Simmons expressed for the opening of the park. Listening to the warm applauds that the Mystic River Boathouse Park Implementation Committee, Chad Frost and Alex Anmahian received at the end of the evening, the attendees were in favour of what they had seen and heard. Editor’s note: This article was written some days ago. After an article in the New London (Connecticut) Day about the Thursday meeting about the unveiling of the proposed master plan was published, the design of the boathouse got heavily criticized on the Stonington Community Forum Facebook and in comments for the article in The Day. HTBS will come back with comments about this criticism on social media.